Lately, my boys have suddenly been very keen to bake with me. "Can I break the egg?" and "Let me stir!" are constant phrases that I hear in the kitchen. I'm happy that they want to take part in something I enjoy so we work together even if it means that some flour gets spilled on the floor or the counters get splattered with batter. Today after school the request was for chocolate mousse cake. Unfortunately, I did not have the required ingredients for it so we settled on plain ol' chocolate snacking cake. We read the ingredients, gathered them all and started. I find that by giving my children individual jobs, they feel like they're contributing and creating at the same time. First, grease the pan. Second, measure the buttermilk and so forth. After pouring our chocolatey batter into the pan, we waited patiently for it to finish. When I pulled the cake out of the oven, my son was beaming and I said to him, "Wow! Your first cake! We'll call it H's Special Chocolate Cake." A priceless moment. So hopefully, they've got the baking bug now. Trust me when I say that the recipe is child- friendly. The cake is very good and is super moist. It is made in a 9 x 13-inch pan so there's plenty for sharing. I dusted the cake with icing sugar but you can ice it if you like and don't forget to add some sprinkles too! 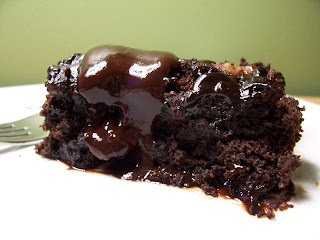 Hot Fudge Pudding Cake - easy to make and eat. Not so easy to photograph. 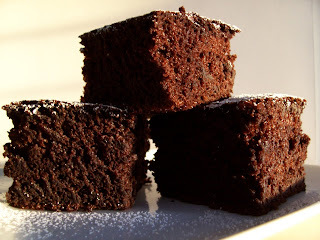 Imagine fudgy chocolate cake topped with a thick chocolate pudding all whipped up in the same pan. How is this possible you ask? It is very simple and I will tell you now how to make this magical dessert. First, make the cake batter. Secondly, top the batter with dry ingredients that will sweeten the pudding. Lastly, pour hot water over the whole thing and do not stir. The magic will be lost if you do. Set your timer and load the dishwasher. Turn on the oven light and see how your concoction has suddenly turned into a cake with bubbling pudding underneath it. Amazing! This version of pudding cake is very simple. All you need is a bowl for mixing and a kettle (or a pot) to boil water. I have made pudding cake before and was undecided on whether I liked it a lot or just a bit. I have to say that I am still undecided though the cake was very tasty and moist. I just find that the pudding tastes flat, not very flavourful like real pudding. Can you make this cake with hot milk instead of water? If so, it may make the pudding more yummy. Nevertheless, try it out if you've never made one before. It is still a nice dessert and would go very well with whipped or ice cream. I think most bakers out there have a standard banana bread/muffin/cookie recipe they turn to when their bananas turn black. I usually make banana cookies which only requires one banana but, more often than not, I have about 4 leftover by Friday. A friend was coming over for tea so I needed something to serve, as tea without eats is incomplete. Criteria 1: Recipe must use more than one banana. 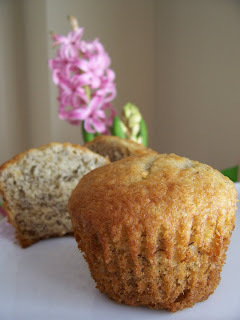 Out came Robin Hood Best Baking and I flipped to the index scrolling 'banana' and found muffins. Not too exciting but, it fit my two criteria and I got to work. The thing I really like about these muffins is their flavour. There are three bananas in the batter so you get real flavour, not just essence of banana. The riper the bananas the better. After baking for 25 minutes, they cooled for 5, and were almost all eaten by two hungry boys. I did manage to save some for tea, and they were much appreciated. As always, you can add stuff to make them yours (chips, dried fruit or nuts) but I really enjoyed them plain. They're easy easy easy, perfect for packing in lunches and fun to make with little kids. If you're looking for a great cookie that combines two popular cookie flavours, look no further - these Peanut Butter Oatmeal Cookies will fit the bill. 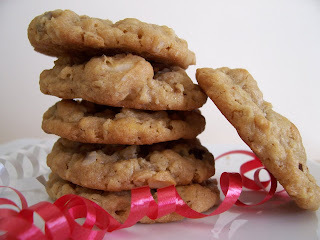 I wanted to make an oatmeal cookie this past weekend and when I found this recipe with a twist I decided to try them out. After making a peanut butter batter, oats were added along with raisins and Brazil nuts left over from the muffins. At first I thought raisins wouldn't go with peanut butter but they do, and very nicely I might add. The Brazil nuts added great crunch. I used natural peanut butter for this cookie which worked great and the cookies baked up beautifully. The flavour of the cookie really is a cross between peanut butter and oatmeal so its like you get 2 in 1. You can also add-in dried cranberries, different nuts and different chips to personalize your cookie. Anything goes! Mmmmm muffins. I love making muffins. They can be healthy (or not), are quick to make and perfect for giving away or packing in lunches. 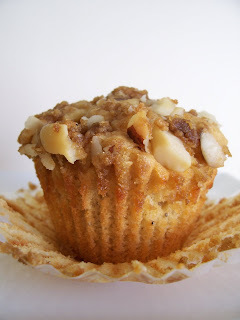 What first caught my eye about these Pear Streusel muffins was that I thought they'd be great for using up ripe pears but, upon further reading, I realized the recipe called for dried pears. I thought that was really interesting as I've never used them before. Another bonus was that the recipe called for Brazil nuts which I've eaten but not baked with. The nuts I bought were whole so I had to slice/chop them the best I could. The pears were chewy and have the texture similar to a dried apricot. After grinding fresh cardamom, I made the beautifully creamy batter, sprinkled with a brown sugar streusel and popped them in the oven. The muffins turned out great and made the house smell amazing. If you love cardamom you'll love these muffins because its flavour takes centre stage. With a cakey crumb, chewy fruit and crunchy nuts, these muffins are anything but boring. They are assertive and great with hot tea. Try them if you're looking to experiment with new ingredients or different spices. They're very lively. Update: I've submitted this muffin for Muffin Monday hosted by Elena at Experiments. The deadline for submissions is today (March 2, 2007) so you still have some time to participate! Thanks to Elena for hosting a fun and creative event. I really enjoy the luxury of baking with nuts. I've used many types in cookies and cakes but one nut that has never seen my kitchen is the macadamia. This valuable nut does not come cheap or low in monosaturated fat. I bought some and found their taste to be similar to a water chestnut - very crunchy and clean. 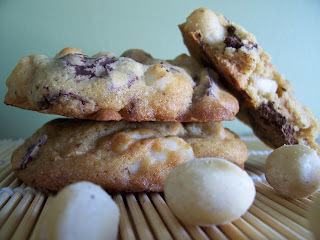 I decided to try out a recipe using these opaque white orbs because sometimes when I'm at Subway (and no one is looking) I pick up one of their white chocolate macadamia cookies. Something had to be done. The recipe I used came from The Good Cookie and was created by Andrew Garrison Shotts, a former pastry chef of the Russian Tea Room. The dough is rich and creamy and just when you think you're done, macadamia nuts, peanut butter chips and chopped bittersweet chocolate are added to the mix. What you end up with is a satisfying chunky batter that turns into lovely flavourful cookies. One thing about these cookies that is a little different is that they're bigger. You have to use a 1/4 cup measure or cookie scoop to dish out the dough. This makes each cookie very substantial so having a glass of milk nearby is a good idea. One suggestion that came from my son was to make them 'regular' cookie size next time. Also, the macadamia nuts were not a hit with the kids. I kept finding discarded nuts on the table so I ate them making a note to use walnuts or pecans next time. Overall the cookies were yummy and I'd bake them again making the mentioned changes though I'm glad I used the macadamia nuts this time. They're easy to work with and tasty too! When its cold outside nothing makes a home feel warmer than turning on the oven and baking up something yummy. This was my situation on Saturday night. The winds were howling and the snow was blowing and all I had on hand were your basic baking ingredients - butter, eggs, flour and milk. What could I make with such a limited cupboard? Pound cake you say? Well, that's exactly what I did. Pound cake seems to be a favourite of many people. It's firm texture and little crumb make it ideal for making into trifles or parfaits. It holds its own with a cup of tea even if it is plain and without adornment. It slices lovely and I hear is great eaten straight out of the freezer. Of course, it is an extremely accepting cake so add-ins such as chocolate chips or poppy seeds are most welcome. I added orange zest to the cake I made and the flavour was light but detectable. 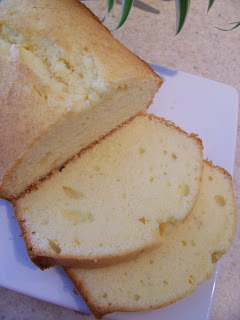 It turned out moist and tasted exactly as pound cake should - golden and buttery. It may not be the fanciest recipe but is a keeper in my home and perfect for the novice baker.